Just over a year ago, I had the privilege of speaking with Schea Cotton. Cotton was widely regarded as one of the most promising NBA talents ever. Cotton played over 10 years professionally but never in the NBA. His story is a prime example of exceeding expectations in spite of what people think he did or didn’t do on the court. 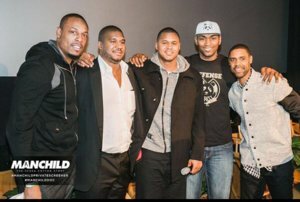 His biopic; Manchild: The Schea Cotton Story, will be seen during the 2018 NBA All-Star Weekend in Los Angeles, its last private screening. From there his story goes nationwide. I was fortunate to catch up with Cotton, and again learn how gracing the pages of Sports Illustrated at 15 may sound like a dream come true, but in reality, was the beginning of how he became a leader, a mentor, and someone people of all ages can appreciate. The GM’s Perspective: It’s been a while since we last spoke, what’s been going on? Schea Cotton: Wearing a lot of hats! Currently building a foundation; Manchild Elite Corp. It’s my sole focus right now; assisting our youth, educating and empowering them through mentoring and participation in athletics with a focus on integrity and hard work. 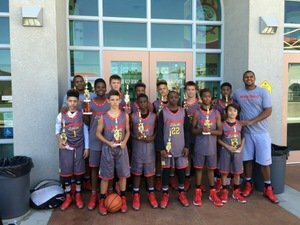 We also created a local based AAU team (SoCal). We’ve got about seven or eight guys that are working very hard and becoming very competitive. There’s a big tournament (A.C.E.S.) this weekend that we’re preparing for followed by the AVEC Hoyas New Years Kick-Off Classic at the end of the month. The goal with the program is to put the kids in the best situation as possible and teach them the game of life through sport. 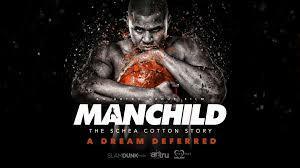 GMs: Manchild: The Schea Cotton Story will be having a private screening just prior to the 2018 NBA All-Star Game and released sometime in March. How do you think it will be received (by the older generation of players and new generation)? SC: I think it’ll be good. We’ve shown it at a few festivals and get mentioned or win awards at every single one. We want to get it out to the masses. Part of the February 12th private screening is to bring the who’s who out to see Manchild. Big names, celebrities, ball players; we want this to be the biggest one because it’s our last private screening before it become available to the public. GMs: Your prolific profile showcased you as one of, and quite possibly, the best high school player/pro prospect of all time. It really takes a special type of person to be able to handle all that hype. Today it’s almost impossible for the accolades to not be mentioned somewhere within social media. What do you say to a young up and comer or someone on your AAU team (Manchild Elite), who is showing promise or has the the ability to get to the next level? SC: All the attention is working against them. I don’t think it’s necessarily a good thing, but you can’t stop it. Social media is everywhere. I never had this when I was growing up. If I did I’d probably break the Internet. We maximized what we had in front of us. It was a lot harder back when I was playing. Control begins at home. What you learn from home carries into adulthood. The integrity that I live by was taught to me by my father and my mother. It starts in the household and carries on into the real world. When you get out in the real world with all the notoriety, fame, money… it’s devastating if you’re not prepared for it. When it comes to players with potential, keep training like your life depends on it and don’t believe everything you hear. Focus on your strengths and stay around the people that love you for who you are not what you do. I also think it’s very important to have a spiritual component to your lifestyle. You’ll really begin to understand what sacrifice and commitment really look like. GMs: You were a trailblazer, a player who was bigger than the game at your peak. Did you ever think you’d be a leader and mentor to past and future players? SC: I knew at some point I would do something that would impact lives for years to come. My goal was to leave a legacy. I just didn’t know how I was going to do that. I feel now that I’m making an impact on the sidelines, not directly as a player, but as a mentor and coach. This is where God wants me and I’m going to be the best that I can be in this capacity. If you could do it over would you? SC: That’s tough considering having knowledge about certain things would directly affect my career. However, I love where God has brought me. I wouldn’t change the adversity I faced because that’s a big part of who I am today. SC: Train like hell and don’t get too high or too low. Be a person of integrity and keep your nose clean. You have to give it everything you have because once it’s finished there’s no do-overs.